Deadheading is a gardening term for the removal of dead blooms from a plant. Depending on the type of plant and the woodiness of the stems, deadheading can be done by pinching off the flower by hand or with pruning shears. Removing dead blooms, before they have a chance to go to seed, encourages the plant to re-bloom. 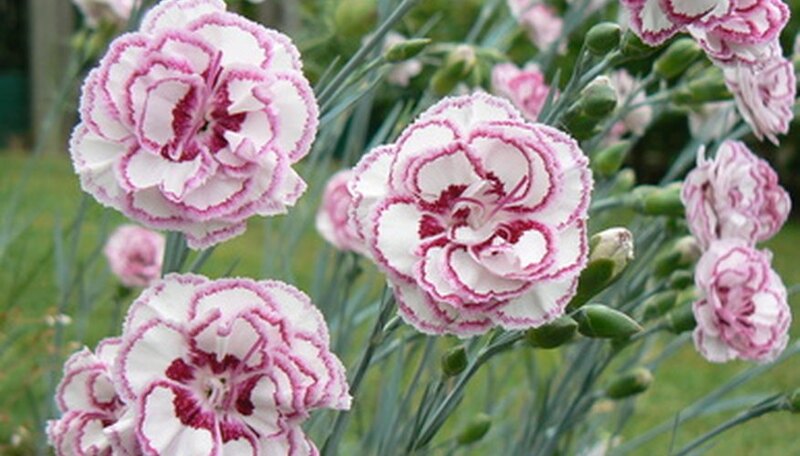 Dianthus, also commonly called carnation or sweet William, should be deadheaded with pruning shears. Because dianthus may re-bloom on each stem, it requires a bit of caution when deadheading. Wait until midseason to deadhead dianthus. Because dianthus is such a prolific bloomer, it is easier to wait until there are many spent flowers rather than deadhead one by one. Check the stems of the dead dianthus blooms for buds. If buds are present, use the pruning shears to cut the stem to 1/2 inch above the bud. If there are no buds, cut the stem down to the first set of leaves below the dead flower. Bag and remove all spent flowers and foliage that you remove from the plant. Garden detritus left on the soil presents a breeding ground for pests.